Have you forgotten how good it tastes? 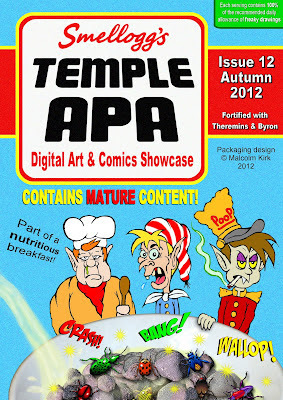 The 66-page Temple APA Issue Twelve is now available to download as part of a complete breakfast a totally free pdf file, containing contributions from the likes of Dave Hailwood, Paul Eldridge, Simon Mackie, Tony Suleri, Adam Grose and Malcolm Kirk, who also provides 100% of the recommended allowance of front cover, which you can see on the right these words, (unless you're standing on your head or something, in which case - what on Earth are you doing that for? Get the proper way up this instant! How can you even work a mouse like that?). You can download from Dropbox, MediaFire or view online at MyEbook. PDF file size is 17.6 MB. 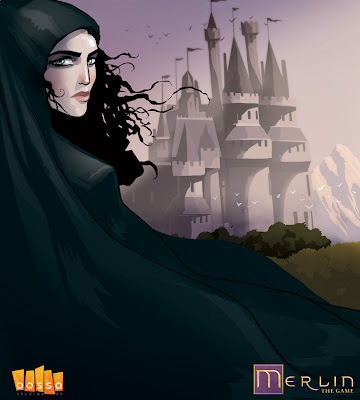 BBC's Merlin turned into a game - so, where's the comic? Yes, yes, we know this is a British comics blog. But what's wrong with a little bit of a distraction when Merlin, the one BBC show crying out to be a comic is developed as a game? (We're still hoping someone develops a comic although, five seasons in, we suspect the show may reach a natural closure before so long). Anyway: Merlin: The Game, the work of award-winning London-based Bossa Studios, is now available to play in open beta via Facebook: a fun and beautifully crafted game that introduces casual gamers to a real-time, co-operative, role-playing experience on the world’s most popular social network. Merlin allows you and six of your best friends to fight off hordes of monsters, complete quests and explore new exciting areas. As you battle across Camelot and gain experience points, level up, you can also customise your character with the skills you want to use. Progressing through the game allows you to upgrade your equipment from the basic clothing of the medieval age to shimmering suits of armour, or colourful sorcerer’s robes; and be part of the story in the action adventure game that will always have new content for you to explore. Bossa Studios say they have had a blast developing Merlin: The Game revealing, for lovers of such trivia that the most redesigned part of the game was Merlin's ears, the lyrics for The Knights of the Round Table from Monty Python and the Holy Grail were used as placeholder text during alpha stage; and, during the making of Merlin, the team consumed enough pizza to cover a tennis court. From the visuals we've seen so far it looks great... so where, British publishers, is the comic? In the last in a month of episodes of Panel Borders looking at depictions of travel in comic books and graphic novels, Alex Fitch talks to a pair of cartoonists whose small press and collected comics are all about travelling for the sake for it. 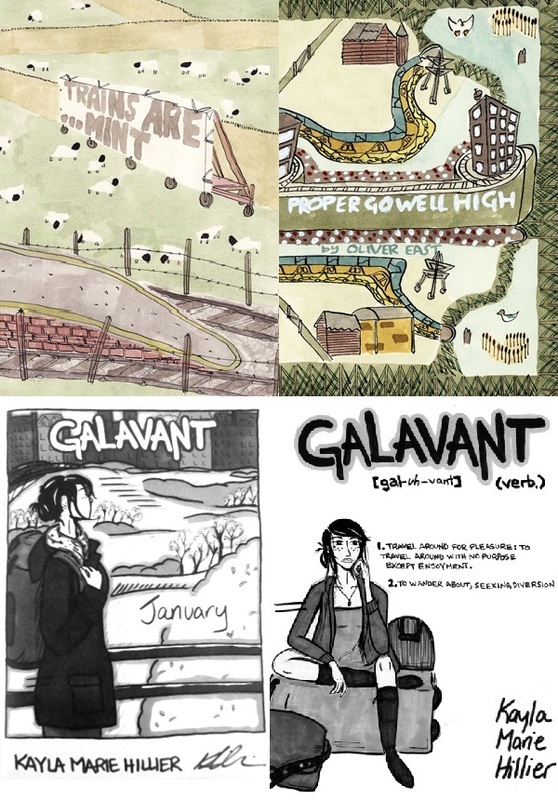 Oliver East discusses his Trains are... Mint trilogy of graphic novels, published by Blank Slate Books, which chronicle his walking along train lines from Manchester to Liverpool and across Germany, as well as his latest project Swear Down. 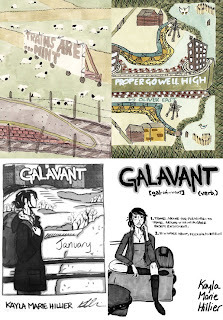 Also, Alex talks to Kayla Marie Hillier about her web / self published comic Galavant which depicted her travels from Toronto to Manchester and back again, via South London, in the Winter of 2009 / 2010 and is available in a collected edition from the author. Largo Winch, writer Jean Van Hamme and artist Philippe Francq's James Bond-like billionaire, returns in his latest two part adventure in Cinebook's The Price of Money and The Law of the Dollar. Appearing on a live TV business programme, The Price Of Money, Largo is as shocked as the viewers when Dennis Tarrant, the former manager of a company that Largo's W Group had taken over and caused 2500 redundancies in, puts a gun to his head and pulls the trigger. With public opinion against him, Largo launches a W Group investigation of that business transaction before travelling to Tarrant's funeral. There he attempts to offer his condolences to Tarrant's blind daughter June but he receives a cold rebuff from her followed by a severe beating from some of the men of the town. The accounts of Tarrant's company appear to have been altered to cause the redundancies and Largo beings to dig deeper just as June Tarrant launches a court case against him for compensation of $50 million. 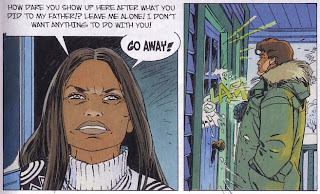 When the former accounts secretary of the company ends up dead, Largo is framed for her murder and, on the run from the law and with American public opinion turning against both him and the W Group, Largo is forced to go to ground. Jean Van Hamme's name on a book is a sure sign of quality and when it is a Largo title then that normally means a James Bond-like action fest, except that this time it isn't really. Don't get me wrong, punches are traded, guns go off and there are motorbike and helicopter action sequences, but on the whole this is slightly more sedate and talky Largo story than normal and, if anything, it is to the story's advantage. 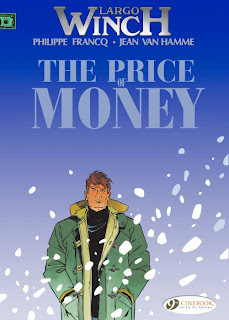 Van Hamme emphasises the insider trading/stock options information in the first book and repeats it as a text introduction in the second as an understanding of it is vital to the machinations of the plot. While it makes for a Largo story that is perhaps heavier on exposition than the previous episodes, it also makes for a story that requires more thought than the more normal Largo romps and I enjoyed that. Philippe Francq's artwork is as slick as ever covering helicopters, bikes and even Mounties on horseback when Largo goes to ground in Canada yet, despite all the panels of talking heads explaining the intricacies of the plot, he never gets into a rut and his work is always enjoyable to look at. 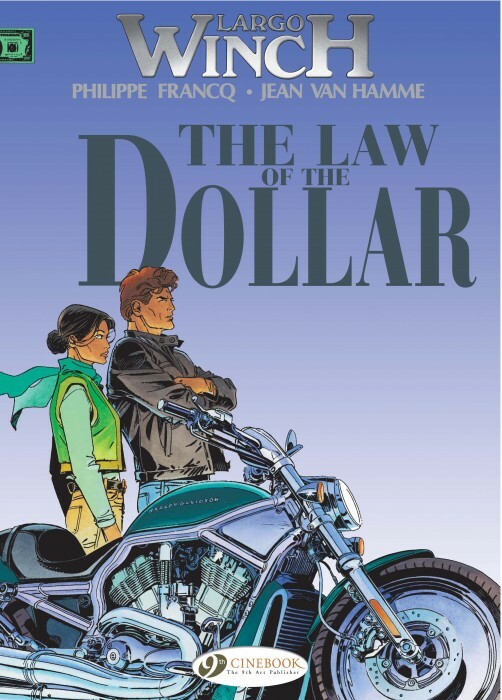 These are translations of the 13th and 14th French Largo Winch albums originally published in 2004 and 2005. In France the series has just reached its 18th book, Colère Rouge, this month meaning that Cinebook have only two sets of two books each still to go before they are up-to-date. The first of those, and the next Cinebook Largo Winch title, is due out in February 2013 under the mouthful of a title The Three Eyes of the Guardians of the Tao. 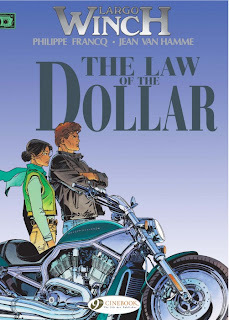 Largo Winch - The Price Of Money/The Law Of The Dollar is not quite the runaround that we have become used to in the previous Largo books but it is no less of an intriguing read for it. 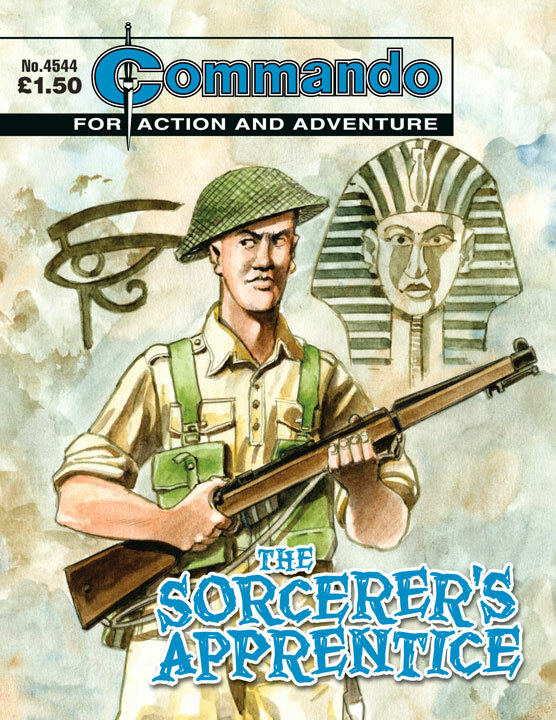 Here's the intel on the latest Commandos, on sale from today in all good UK newsagents and via iTunes as digital editions. In 1941, the Luftwaffe's sleek and deadly Focke-Wulf 190 appeared from nowhere to terrorise the RAF. Even their best fighter, the Supermarine Spitfire MkV, was no match for it. The British needed an intact Fw190 to discover its weaknesses…and a way to defeat it. The top brass came up with a simple but dangerous plan. 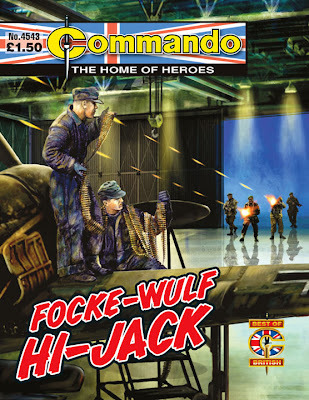 A crack Commando squad would lead a raid to steal a Focke-Wulf from right under the Jerries' noses! All they needed was a pilot. That's when Flight Lieutenant Tam McDermott stepped up. Fluent in German and with a working knowledge of Luftwaffe aircraft, he was perfect - if only he could survive his Commando training! Private Frankie Horton was far from the best soldier ever to serve in the Eighth Army. His rifle was likely to be the dirtiest and his uniform the scruffiest in his squad. He also had a tendency to dream, particularly about being a magician - an ambition he had had since childhood. No-one would have believed it if they were told that, thanks to Frankie, an almost certain German victory in North Africa would be averted. Every regiment has its daredevil, the one man who doesn't know the meaning of fear. In "Popski's Private Army" there were nothing else but daredevils, each one more daring than the next. This is the story of a Desert Army sergeant, who accidentally came to make up a foursome with three of the toughest and craziest of Popski's desert pirates. Men said you had to be certified crazy to qualify for the PPA. Well, maybe Sergeant Dave Jones was at that… Crazy-brave! “When I tell you that this is a fantastic Commando story, you'd be quite entitled to think, 'Well, he would say that wouldn't he?' And that would be fair enough, says editor Calum Laird of this re-presented tale. 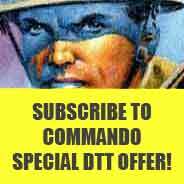 “However, it really is true and I can say it because it was created long before I had anything to do with Commando - even as a reader. 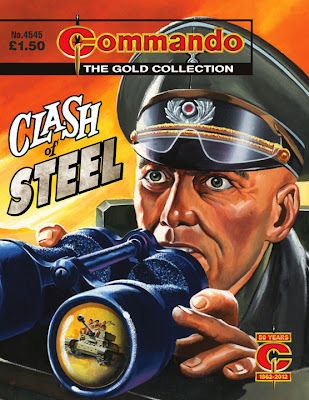 “Starting with Ken Barr's brooding cover with its hint of action in the binocular lens and moving to Alonso's brilliant “pants-on-fire” realisation of the Henderson script, it really is action-packed from start to finish. The fistfight scenes throughout are a work of artistic magic. Do you believe in magic? No? Well, Englishman Sam Benson wasn't too sure either. While out in Australia he saw an aboriginal ceremony where the natives touched a totem believing it would give them courage. Little did he know that several months later, while fighting the Japanese on the far-off island of Ketta, that same ritual would save his life! “Here's another gem of a story from our Silver Collection - a silver gem, is that possible?” says Scott Montgomery, Commando's Deputy Editor. “Back in the 1980s, I was a Commando reader and, as well as the stories, I used to enjoy the inside feature pages too. Sometimes they'd be weapons specs, aircraft illustrations, weird vehicles, quizzes, or World War II trivia, amongst many other things. 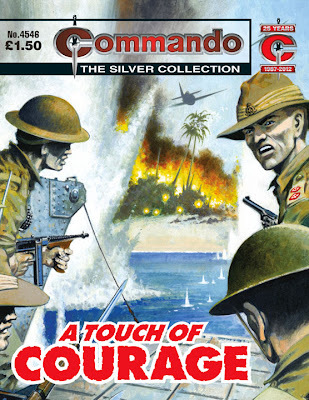 “Now, over 25 years later, it's a privilege (and brilliantly surreal) to be regularly writing a Commando feature page! So, for the trivia buffs among you, if you're interested, the original version of the feature page in this issue consisted of what…? Who said that fatties are all unhappy and unpleasant? "From Superheroes to SuperSized", a new exhibition in Rome featuring the work of Giancarlo Caracuzzo, who drew ROK Comics recently-released free Joe Whelan audio comic, sets out to disprove that. 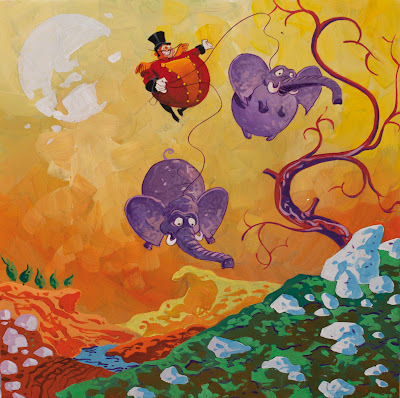 Organized by Fat Lab, the exhibition presents works by Giancarlo and Mauro Caracuzzo with Flavia Caracuzzo and an illustrated story of Giancarlo and Katia Ravaioli. The good news for those of us who just found out about this is that much of the art from the exhibition can be viewed online - and it's well worth a look, because it's beautiful work from Giancarlo. Giancarlo Caracuzzo is a world-renowned illustrator, who has drawn the likes of Martin Mystere, Nick Rider, Iron Man and Spider-Man, and in recent years has contributed to the success of series and miniseries of horror, fantasy and underground, working for Marvel Comics and some of his best-known writers. Caracuzzo offers here his latest, stunning work, a play on the paradox of fat versus thin, creating original and scandalous marriages in this age of media fundamentalism against thoase with weight issues. The exhibtion also features drawings and works by artist and designer Mauro Caracuzzo and Flavia Caracuzzo. 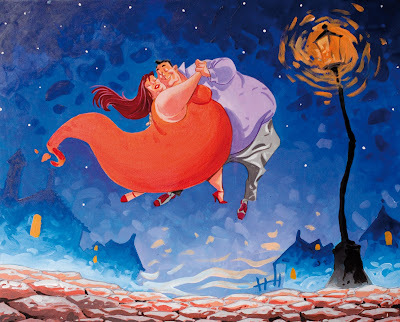 The story Ernesto and Mirella featured in the exhibition is written by Katia Ravaioli and illustrated by Giancarlo, and takes its name from a blog (in Italian) already much talked about on social media sites. It's the story of two misfits who meet dancing the tango, learn to dance and fall in love each other, and eventually themselves. London Super Comic Convention has announced our next wave of comic creators for their next show on the 23rd - 24th of February 2013 as follows, including British artist Brian Bolland, whose credits include Batman: The Killing Joke, Judge Dredd and many more. These new guests join a line-up to Neal Adams, Mark Buckingham, Peter David, Gary Erskine, Klaus Janson, Bob Mcleod, George Pereze, Matteo Scalera, Roy Thomas and Herb Trimpe makes LSCC unmissable again. Another 10 guests will be announced next month and so forth until the show dates. Organisers tell us early admittance to the show at London's Excel Centre, which is available only for a weekend pass will be limited in number. Tickets are selling fast. The nominees for this year's (and first) British Comic Awards have been announced. The awards are intended as the definitive guide to what the very best in UK comics, focusing on great British comic work in five categories: Best Comic, Best Book, Emerging Talent, Hall Of Fame, and Young People’s Comic Award. Hunt Emerson - Master cartoonist, named as one of the 75 Masters of European Comics by the Centre Nationale de la Bande Dessinee et de l’Image, the noted French comics Academy in 2000. His latest publications are a 200-page digital anthology, “The Certified Hunt Emerson” published for iPad by Panel Nine, and his hilarious comic book version of Dante’s Inferno, from Knockabout. John Freeman - editor of ROK Comics digital audio comics, webmaster for the Down The Tubes, editor for the launch issues of STRIP Magazine. Previous roles include directorship of the Lancaster Literature Festival, Managing Editor at Titan Magazines, Group Editor at Marvel Comics UK. Dr. Mel Gibson - academic based at Northumbria University, trainer helping libraries and schools develop collections of graphic novels, comics and manga. She is a National Teaching Fellow and has used that award to sponsor and develop academic events and networks relating to the study of the medium. Stephen L. Holland - co-creator, owner and manager of Nottingham-based comic retail operation Page 45 which was judged Best Independent Retailer in Nottingham 2012. Roger Sabin - Reader in Popular Culture at Central Saint Martins College of Arts and Design, University of the Arts London. Stacey Whittle - writer at SFX Magazine website, long-running indie/small press comics podcaster, who recently edited and published a fairytale-themed comic anthology, Into the Woods. Gazillion Entertainment, publisher of the highly-anticipated massive online action RPG, Marvel Heroes, took the recent New York Comic Con by storm, unveiling three all-new playable heroes from the legendary Marvel Universe: Jean Grey, Nova and Luke Cage. Marvel Heroes also showed over 40 minutes of never-before-seen gameplay at New York Comic Con, giving press and consumers an action-packed hands-on experience as they battled villains like the Green Goblin, Electro and the Shocker. Marvel Heroes, which features an original story crafted by Brian Michael Bendis, is a free-to-play, action MMORPG game created by David Brevik, the visionary behind Diablo and Diablo 2. Set in the heralded Marvel Universe, Marvel Heroes combines the core gameplay style of action RPGs and MMOs with the expansive library of heroes from the Marvel Universe. In the game, players can collect and play as their favourite Marvel Super Heroes as they team up with friends to try to stop Doctor Doom from devastating the world with the power of the Cosmic Cube. 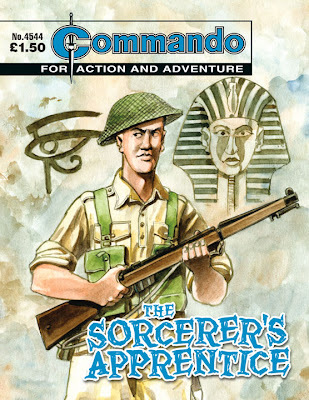 After innumerable delays, the combined Issue 5/6 of the action adventure anthology STRIP is finally on its way to the shops and to subscribers. Despite the problems that continue to beset the title, its Bosnian publisher and founder Ivo Milicevic is determined to continue the project and make good on his plans for continued UK publishing of the title he has already published in his home country and will soon launch in Croatia. THRACIUS by James Hudnall and Mark Vigoroux - A Roman legionnaire against a deadly mystical golem! DENIZENS by Shmumski and Maxim - Mother Earth fights back against the ravages of humankind! DAN BARTON OF SPACE COMMAND by John Freeman and Andrew Chiu - a crazy time travel adventure starring space command's stupidest pilot! Plus humour from Bogey-Man Bob by Gerard Leever and Cosmic Patrol and Mauricet, and all the magazine's usual features. Print Media is then putting STRIP on deliberate hiatus but only until February, when the comics anthology is to be relaunched as a newsstand title, a plan put back several times but still the aim of the publisher. “We will be using this time to continue to resolve many of the problems we have encountered One of our top priorities will be secure a UK shipping company which will be able to deliver STRIP efficiently and on time,” stated publisher Ivo Milicevic. “You wouldn’t believe what sort of problems we have had with carriers… one entire print run is still wandering somewhere in Italy while our latest shipment only got through on the second attempt… no one knows where or how the original vanished! “I am amazed and grateful just how supportive our audience has been. I can promise that the relaunched STRIP – The Comic Magazine will bring more really great art and stories to he newsstands. It will be worth to wait,” he proclaimed. Another reminder about events in Dundee next weekend, that are part of the Dundee Literary Festival. On Saturday 27th October Dundee University welcomes special guest Dave Gibbons, one of the most famous comics artists in the world, and best known as the co-creator of Watchmen, the ground-breaking graphic novel written by Alan Moore and drawn by Gibbons. Gibbons will deliver a talk on the theme of Creating Comics, and will discuss his own methods for producing comic art, and in particular, his use of Manga Studio, which he will demonstrate. 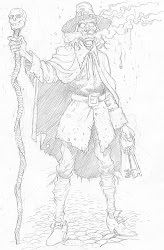 He will also lead a workshop on this theme, which anyone can participate in, but would be particularly useful for anyone who has ever considered creating a comic. Dr Chris Murray, lecturer in Comics Studies at the School of Humanities and Director of the Scottish Centre for Comics Studies said “it is a tremendous honour for us to host a workshop with Dave Gibbons. He is a hugely talented and influential figure”. He added, “to have Dave Gibbons and Grant Morrison in Dundee on the same weekend is astounding - we are very proud that comics creators of this calibre are supportive of the Comics Studies courses and events that the University of Dundee is leading”. Phil Vaughan, lecturer at DJCAD added, “comics students at the Art College and in Humanities will benefit enormously from meeting Dave Gibbons and Grant Morrison, and hearing about their creative processes”. "It's also good to see such interest from the general public in these events," notes Chris, "as this demonstrates that for many Dundee’s proud history as one of the homes of comics production is still something that has a great deal of resonance”. To buy tickets, please visit www.literarydundee.co.uk or http://bit.ly/SXEityTickets are also available from Literary Dundee, 6th floor, Tower Building, University of Dundee, tel. 01382 384413. Please note, this workshop and talk is part of a wider event called “The Comics of Grant Morrison”, so that should be selected. One ticket allows access to all events on Saturday 27th and 28th October. AAIIEEE!!! It's a new horror comic from Dave Candish and Matthew McLaughlin! 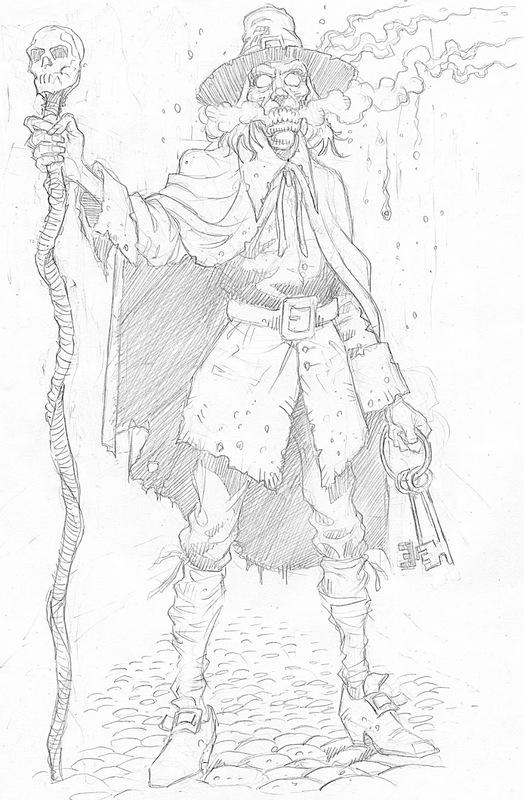 Inspired by their love of the 1970s magazine Tomb of Dracula and 1980s comics Scream and Misty, Paragon editor Dave Candlish and Matthew McLaughlin – creator of El Bigote, the undead Mexican bandit – combine to bring a new indie horror anthology comic to life – AAIIEEE!!! Offering 36 pages of creepy tales including The Major by Tom Proudfoot and George Colman (left) and a host of other short stories to chill your bones, the first issue includes an exclusive interview with Ghastly McNasty himself – the editor of Scream comic Ian Rimmer, telling the story behind the production (and demise) of the short-lived comic that included stories from the likes of Alan Moore and Simon Furman. Launching on Hallowe'en (when else? ), AAIIEEE!!! will be available to order in print or download from www.lulu.com/spotlight/PARAGONcomic.